Venue: Royal Geographical Society (with IBG), 1 Kensington Gore, London SW7 2AR (entrance in Exhibition Road). 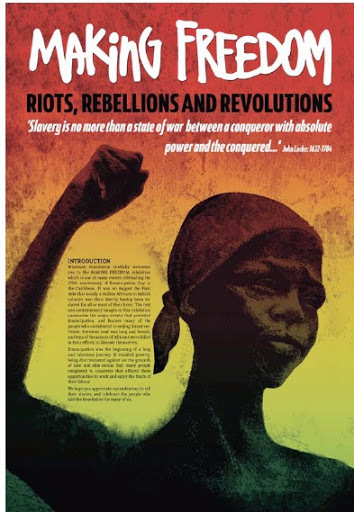 Windrush Foundation presents a story featuring riots, rebellions and revolutions in a free exhibition at the Royal Geographical Society (with IBG) in Kensington, London. Making Freedom (6 November 2013 – 21 December 2013) takes guests on a journey up to and beyond 1838, when nearly one million Africans were freed from enslavement in the Caribbean. This is the first time that important collections from Royal Geographical Society (with IBG), the National Maritime Museums, the National Portrait Gallery, the National Archives, Anti-Slavery International and the Imperial War Museum have been brought together in an exhibition. The exhibition will celebrate those resisted enslavement, those who fought to end it, and others who worked in Britain to improve social, economic and cultural conditions in the Caribbean. Visitors will learn about the unrest – such as Jamaica’s 1931 ‘Christmas Rebellion’ – that ultimately led to emancipation, as well as the struggles for independence that ensued. The exhibition features more than 80 images from the Society’s Collections and includes a number of audio-visual experiences for visitors to delve deeper into individual stories. Members of London’s diverse communities have participated in the design of Making Freedom, giving feedback on an earlier version of the exhibition. Dr Rita Gardner, RGS-IBG Director, said: “The Society is delighted to share our geographical Caribbean Collections with partners led by Windrush Foundation. The fresh perspectives of London communities have brought a contemporary relevance to our historic items and this has been a real source of pleasure.